Why should I even care about learning how to replace a chainsaw oil pump? Chainsaw oil pumps help to keep the machine from overheating and keeping them in top shape will prevent early damage. Oilers need to be changed every now and then, usually when you spot a chainsaw oil leak or when you notice that the chainsaw bar isn't getting enough oil. One option you have is to go to professionals for a replacement of the oiler; alternatively, you can learn how to replace a chainsaw oil pump and handle the replacement yourself. This can help you save money and enjoy an interesting activity, but you shouldn't attempt the procedure without understanding it completely. If you get stuck, you can always ask for help or call a trained professional. Oil pump- This has to be specifically for the model of your chainsaw. Include all the characters in the right order when shopping for the replacement part. In addition to these items, you will need a piece of cloth to clean oil that will inevitably fall on your working surface. You will first need to release the chainsaw trigger. The ignition switch should be turned off to make sure the engine is not running. Once it cools down, you can remove the cover of the machine using the screwdrivers. Then, you need to pull the spark plug boot out of the engine. Once that is done, you can place the wrench on the spark plug and turn it anticlockwise. Afterward, you can pull the spark plug out the engine. You can follow the instructions in your chainsaw manual to remove the clutch cover bar and the chain. You should wear gloves when you remove these parts. The remaining oil should be drained into a container and should be disposed of properly. Make sure you read your local laws regarding oil disposal first. Use a funnel for this procedure so as to prevent spillage. Also, you need to seal the container if you don't want to clean up spilled oil. You will need to use the flat blade screwdriver to unscrew the clutch. You can also improvise tools for this purpose, but that may waste a lot of your time. You should turn the clutch right in order to remove it. The crankshaft will turn while you try to remove the clutch, and that is where the soft rope becomes useful. You can insert the soft rope into the spark plug gap and then turn the clutch clockwise. When the clutch cannot move anymore, you can use the hammer and punch to take it out. You will also need to remove the washer position behind the clutch. Using the T25 screwdriver, you can unscrew the handle and remove it. The same tool can be used to remove the chain brake. You should start by cleaning up the pump area with a piece of cloth. Using a Philips screwdriver, you can unscrew the pump. The pliers should help you remove the oil pump from the chainsaw. Also, you will need to remove the pump drive and disconnect the hose. Once all this is done, you can clean up the area once again using a piece of cloth or towel. You can also use an air conditioner to get rid of air in the chainsaw. Cleaning up will prevent sawdust from clogging the pump. Replacing the oil pump only requires you to insert the pump drive into the crankshaft. The hose must be reconnected to the tank pick up before you install the new pump. Once this is done, you can use the screws to securely hold the new chainsaw oil pump in place. The chain brake and handle simply need to be reinstalled using T25 Torx screws. Then, you need to install a washer into the crankshaft, after which you can install the clutch. You can then install the clutch drum. Make sure it rotates freely, and the clutch should be tight enough. At this point, you will need to install the washer and retaining clip. Be sure to remove the soft rope from the spark plug hole. Pull the starter plug to make sure everything has been installed correctly. Next, you need to thread the spark plug into the chainsaw cylinder. You will need to adjust the gap between the ground electrode and the center electrode. The ground electrode is also known as the metal strap. You can use a spark plug gapping tool to measure this distance. The same tool can be used to adjust the gap to the correct size. To do this, you need to adjust the position of the strap with respect to the center electrode. The gap can be adjusted to 0.026 of an inch. The spark plug socket or wrench will be useful in this step. Once this is done, you can install the spark plug boot. After that, you can secure the top cover with the screws. For the bar chain, you will want to consult your user manual for clearer installation instructions. Finally, the chainsaw will need to be filled with oil. You can test it out to make sure it has been installed correctly. If it still has issues, you should consider taking it to a chainsaw oiler repair shop. This is all you need to know on how to replace the oil pump on a chainsaw. Organize all the disassembled parts appropriately. That way, you will only need to follow a given order when fitting them back. 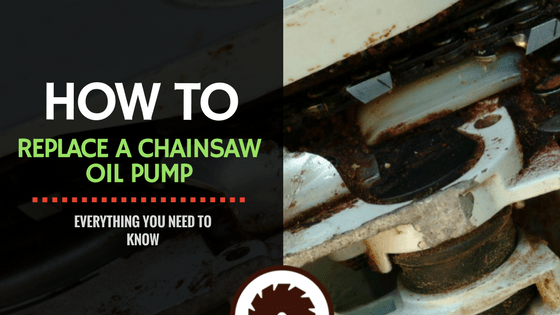 I hope you enjoyed this step-by-step guide on how to handle a chainsaw oil adjustment. DIY repairs are often a lot easier than you may think. Be sure to abide by this guide to the letter. Also, make certain to follow the recommendations in your user manual. If you have any questions or thoughts regarding this instructional guide, you can let me know in the comment section below.